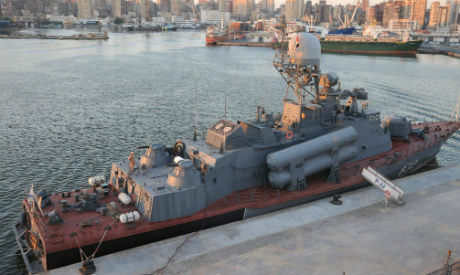 Russia has ‘gifted' Egypt with a new missile corvette that was part of the inauguration of a new Suez Canal expansion project earlier this month, Egypt's army said. The move by the Russian government to "gift" Egypt the Molniya missile boat is "part of military cooperation between the Egyptian and Russian armed forces" as well as indicative of "Russia's support for Egypt and the matching visions of both countries on the war against terrorism," Egyptian military spokesman Mohamed Samir said in a statement Saturday. Considered one of the most advanced units in the Russian naval fleet, the ship features multiple armament systems including surface-to-surface missile—the world's fastest naval rocket system. A group of Egyptian navy officers are set to be dispatched to Russia to receive training on the new missile ship, the spokesman added. Cairo and Moscow are seeking to bolster defense ties as Egypt’s relations with the US have soured following the 2013 ouster of Islamist president Mohamed Morsi. In June, Russia and Egypt held their first ever joint naval exercise. Russia's President Vladimir Putin and Egyptian president Abdel Fattah El-Sisi exchanged visits in February in an effort to strengthen ties between the once Cold War allies. El-Sisi is expected to hold talks in Moscow during a two-day visit later in August. The United States delivered eight F-16 fighter jets to Cairo two weeks ago to support "security and military efforts to confront terrorism" in Egypt, which is fighting an Islamist insurgency based in the North Sinai border region. The delivery was part of a military package that had been unfrozen in March. Washington also delivered two navy vessels to Egypt in June, doubling Cairo's total fleet of fast missile craft to four. A nice gift to Egypt... Thanks to your President Sisi's wisdom to play his cards right, for the benefit and security of Egypt. And a large dripping egg on incompetent Obama's face. Congratulations to Egypt and the Egyptian Navy. Thanks to our friends in Russia for their unwavering support in the past and now. Probably they will use them in helping Saudi Arabia when they need it in conflicts like Yemen. but Egypt is not going to get any benefits from weapons like missile boat, Rafael jets. In the Nineties, Russia was facing food shortages; Today, their wheat exports are among the highest in the world. Perhaps they can teach us how to feed our poor with modern agriculture, rather than invade our Arab neighbors!